One of the most valuable things I’ve learnt in my life is that how I feel and behave is largely down to me. Generally speaking, no one can make anyone else feel or act in a particular way. Discovering the power of choice – knowing you can choose how to respond to situations rather than blindly reacting to them is hugely empowering and a fundamental step in taking responsibility for shaping your own life. So isn’t it about time you took being happy seriously? It’s easy to get submerged by your own troubles and challenges and by world crises playing out around you. But in order to function effectively and live in a fulfilling and meaningful way, you need to be happy and feel good within yourself. And rather than leave it to chance, it’s within your power to cultivate your own happiness. Notice what gives you inner happiness and do more of it! Take pleasure in the simple things life offers. Lower your expectations and recognise when your best is enough. Appreciate your daily achievements, no matter how small. Cultivate a kinder, less self-critical attitude towards yourself. Look to see the good in others. Practice small acts of kindness (it feels nice to give). Be thankful for all that’s positive in your life. Giving thanks to the universe, a higher force, nature (whatever fits for you) will connect you to the good things you already have but may take for granted. Respect and look after your physical needs, such as getting enough sleep, rest and having a healthy diet. Make time for having fun and play. The feel-good effects of endorphins can stay in the system for up to twelve hours. Meditate, practice yoga or use relaxation tapes. As well as calming you they will boost the production of endorphins. Exercise regularly – walking energetically whilst swinging your arms is an easy way of raising endorphin levels. Be spontaneous to get a shot of those endorphins! 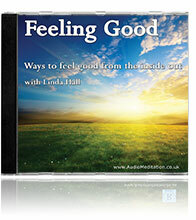 Uplifting, endorphin raising meditations to help you feel better in yourself and about life generally.